Get a low total cost of ownership (TCO) and print up to 30 pages per minute (ppm) with the Lanier SP C361SFNw Color LED Multifunction Printer (MFP). For small companies and teams of up to four people, the SP C361SFNw produces professional-quality color documents at up to 1200 x 1200 dpi-resolution  letting you communicate more effectively. Plus, you’ll enjoy a low cost per page (CPP) with high-yield supplies and monthly volumes of at least 1,500 pages. Simplify your work life with a customizable, seven-inch Smart Operation Panel (SOP) that offers tablet-like functionality and is preloaded with apps that help you streamline common tasks. 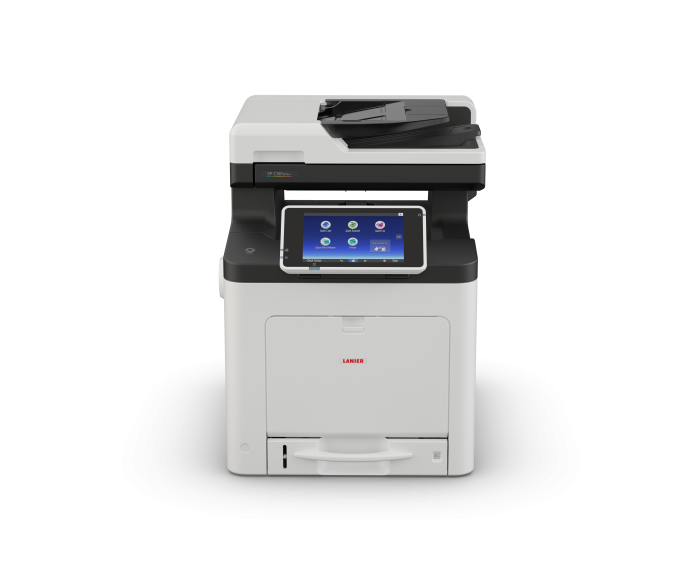 Access the internet from the MFP’s touchscreen to download additional apps at the RICOH Application Site, and print from and scan to the cloud with the optional RICOH Integrated Cloud Environment (ICE). Get up and running in no time with the SOP’s intuitive setup wizard.